CHARLOTTE COUNTY, Fla. -- Deputies have arrested a Port Charlotte man they say left his children home alone late at night while he went out to get Suboxone. 39-year-old Kenneth Jobst is facing a charge of Child Neglect without great bodily harm and remains in the Charlotte County Jail. According to a Charlotte County Sheriff's Office report, a deputy pulled Jobst over on Tamiami Trail around 1 a.m. on January 12th. Deputies say Jobst was on the phone with his wife, telling her to get home because he was worried about the kids. Deputies asked Kenneth about the kids, and he said the children, ages 1-year-old and 3-months-old, were home alone. Deputies went to the couple's 2nd-floor apartment on Winchester Boulevard in Port Charlotte, and found the children safely asleep in their beds, but the front door was unlocked and close to the stairs. The wife later told deputies that she had gone out to a bar around midnight but was called by Kenneth a short time later and told to go home "because the kids were home alone and he was out with police," the report states. 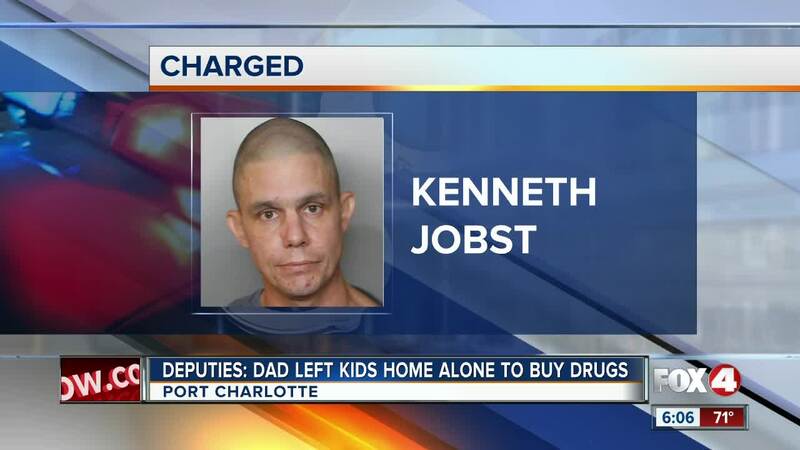 Deputies arrested Jobst, saying he knowingly left the children home alone, while he was their only caregiver, to acquire controlled substances. The children were placed in custody of DCF while the case is under investigation.